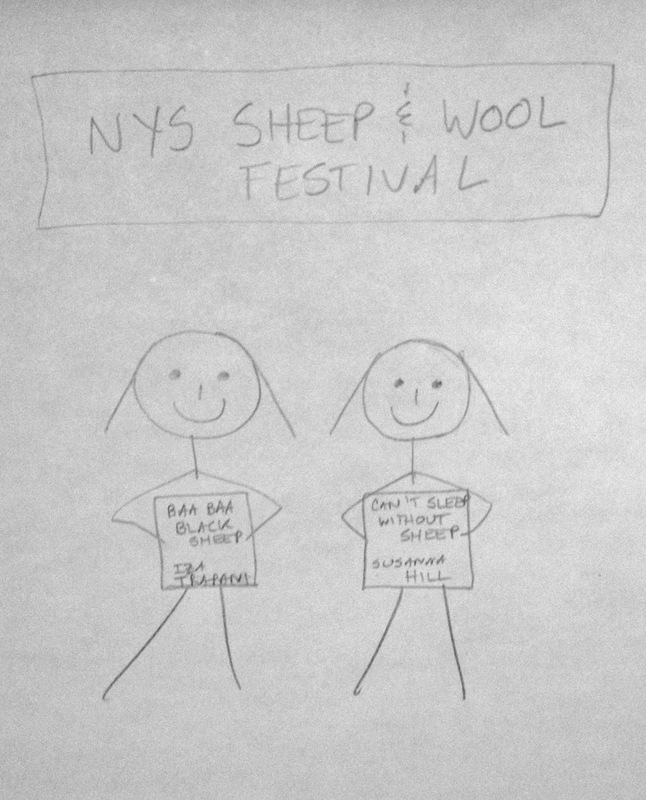 I just flew in from the New York State Sheep & Wool Festival and boy are my arms tired! Thank you, folks! I’ll be here all week! Try the chicken cacciatore! Seriously, though, I really did go to Sheep & Wool and I had tons of fun! 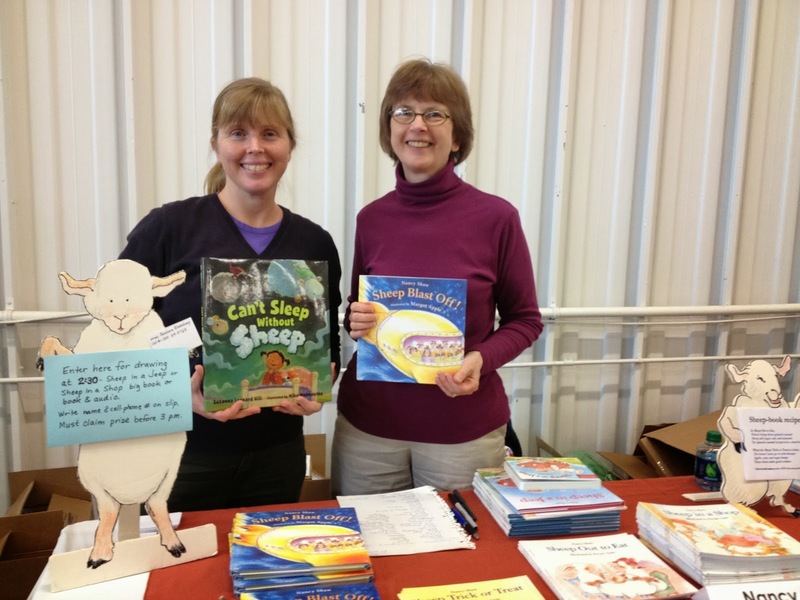 More than 3 people bought copies of Can’t Sleep Without Sheep – awesome! 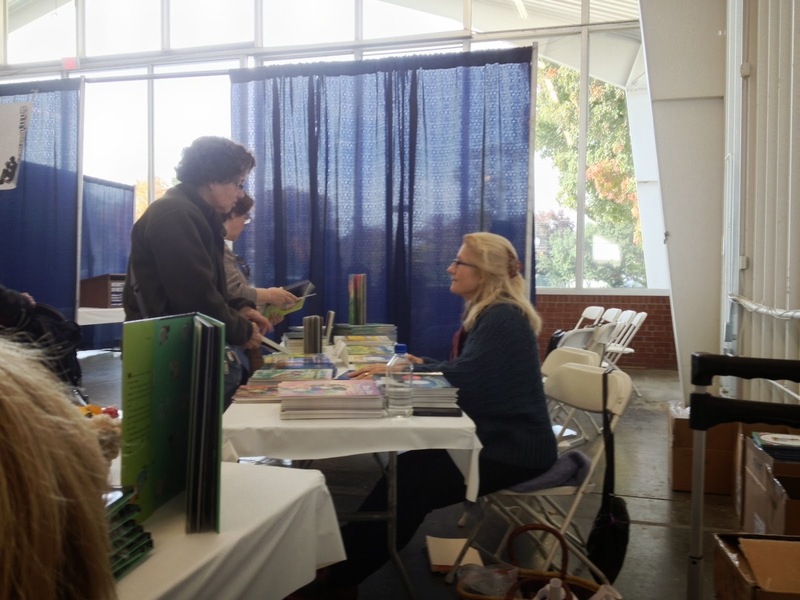 My signing table was right next to Nancy Shaw – yes, THE Nancy Shaw who wrote SHEEP IN A JEEP and many, many others – books I read over and over to my kids when they were little – and I got to meet her and be in a picture with her! Oh, and before we go, now seems like a good moment to mention some upcoming fun stuff! Monday November 11 will feature an interview with the one and only Mike Allegra! Wednesday November 13 we will have a very special Would You Read It! 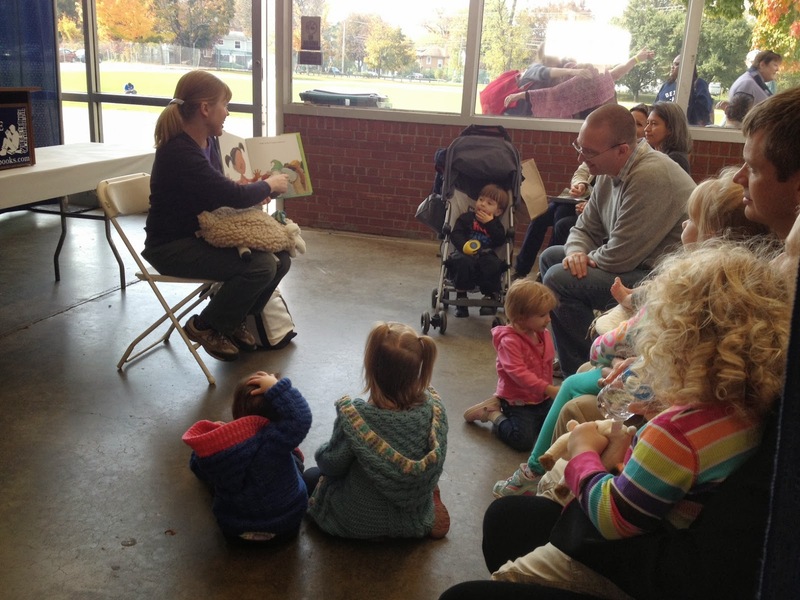 Monday December 2 we’ll be having our Rhyme Clinic with Linda Ashman! I enjoyed the photos! How neat to have met Nancy & Iza! I do adore those photos, even the hand drawn one that makes me feel pretty alright cause I think you and I are in the same artistic boat when it comes to drawing, though you may have an advantage since you actually drew the heads with nicely shaped circles lol!! Haha, Susanna! I'd say you sold more than three books! I'd have asked to have a picture taken of both of us, but that would have meant interrupting the crowd lined up at your table! It sure was busy, wasn't it? Yesterday was the same. Finally slowed down after 3. I wish we'd had more time to chat…I loved meeting your daughter. She's delightful! Wow! I love Nancy Shaw. I'd have had trouble keeping it together with such a super-hero at the same table. So glad it went well for you. Sheep books rule! You can't pull the wool over our eyes! Sounds like you had a grand time with other SHEEPish authors. Love these photos and especially the drawing of you and Iza – amazing likenesses! What a swell event. Sounds like you have some fun treats in store for us on the blog. It was pretty cool to meet her in real life – I felt intimidated by her greatness, but she was very nice 🙂 Whenever I go to Sheep & Wool I want to write another sheep book because sheep are so cute and everyone there is so nice! That sounds baaaeutiful! And what a fun load of posts coming up. Let's see how organised we can all be lol. p.s. I'm painting you next 😉 Do you want me to use the lovely one on your blog or another one? Same here. Although I think it's easier to draw cookies, than salads. Sheep and Wool Festival! I didn't even know that was a thing. Turns out to be the perfect thing for you! Lucky you captured it all in pictures. ….sort of. 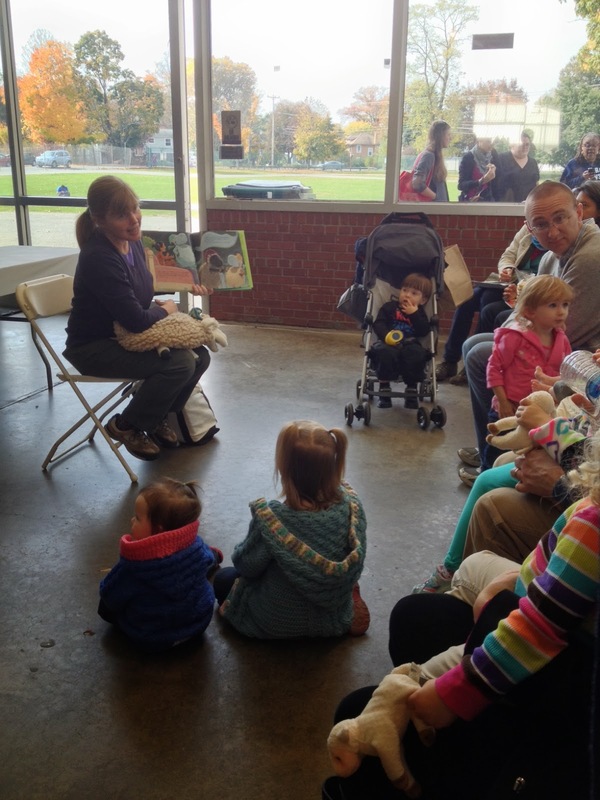 I didn't know there was a Sheep and Wool Festival — that's a pretty creative place to go promote books. Sounds like you had fun. You have some interesting guests lined up and a lot on your plate. I recently reviewed The Field Guide to Fleece: 100 Sheep Breeds & How to Use Their Fibers for the Sacramento Book Review. I don't know why I picked that. I just thought it had to be fun. And it was. I'll bet there were a few copies of that floating around the festival. It sound like it must have been great fun. Glad you sold some books too. The festival is amazing, Rosi! It's the biggest on of its kind in the country! You can't believe how many sheep and wool enthusiasts there are. Such gorgeous yarn! So many beautiful sweaters and hats and scarves! So many books on how to knit and crochet, make your own yarn etc. And all these demonstrations of shearing, carding, spinning, weaving etc. It's really something. Also alpaca and llama! If you're crafty (or like sheep :)) you would love it, Pat. It's quite the event for knitting, weaving, and crochet enthusiasts as well as those who love and care for sheep, alpacas, and llamas. And everyone is so nice! I like the illustration the best! How fun you were with fellow sheep lovers! I must look up to see if there is a festival for one of my animal characters. 🙂 Just so I'll have a goal beyond the typical submit to agent and get it published, etc. Tiny details really. I'm looking for a festival. You illustration makes me think of a new book idea – “Diary of a Wimpy Author” 😉 (not that you are one) 😀 The festival looks really fun! I wish I was there!